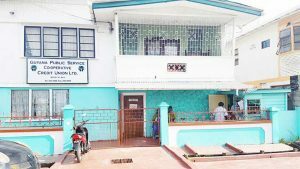 The Government-appointed Interim Management Committee (IMC) will remain in control of the Guyana Public Service Cooperative Credit Union Ltd. (GPSCCUL) following a High Court decision yesterday by Justice Navindra Singh. Perlina Gifth, the Chief-Cooperatives Development Officer and Commissioner (CCDO) of the Ministry of Social Protection, had assumed control over the union on May 25. This triggered a series of court actions. Justice Singh’s decision was made in relation to court filing from Chairman of the displaced management committee of the union, Patricia Went. She filed a fixed date application on June 12, seeking in essence to challenge and set aside Gifth’s decision. Deputy Solicitor General, Deborah Kumar, and Assistant Solicitor General, Beverley Bishop-Cheddie of the Attorney General Chambers argued against the application on behalf of the CCDO. It was argued that Gifth had to first pursue the procedure set out in regulation 56(3) of the Co-operative Societies Act by filing an appeal to the Minister within 21 days of the decision of the CCDO. Further, it was presented that Went ought to have exhausted all the remedies before an application was made to the High Court. It was also submitted that Went ought to have made an application for judicial review and not for declarations and injunctions. Went had submitted that she was not provided with any reasons prior to the decision by the CCDO to assume control and was therefore deprived of natural justice. In this regard, it was contended on behalf of the Attorney General that the provisions of Regulation 56(2) did not envisage that reasons were to be provided. However, it was pointed out to the Court that the CCDO acted lawfully in her decision to exercise control. Justice Singh noted that the authorities do not demonstrate that if an aggrieved person is not given a hearing that person can as of right abandon the statutory defined right of appeal provided. The High Court Judge pointed out that if indeed Went was of the firm belief that the Committee of Management’s right to be heard was breached then the appeal process laid out in the Co-operative Societies Act seems to be the next logical step to challenge the decision by the CCDO, provided, of course, that a majority of the members of the Committee of Management were desirous of challenging that decision. Citing a number of irregularities, Gifth appointed the IMC, which comprise of Justice Prem Persaud, Patsy Russel, Trevor L. Benn, Rajdai Jagarnauth, Gillian Pollard, Oneidge Walrond-Allicock, Patrick Mentore and George Vaughn. The court heard that the former management committee had become incapable of managing or wilfully neglecting to conduct the affairs of the society in a proper manner in that there were breaches and non-compliance of Regulations, which provides that the accounts of the society (Guyana Public Service Co-operative Credit Union Limited) should be audited at least once annually. It was pointed out, too, that there had been no auditing of accounts and no financial statements since 2010, and, further, those audited had not been approved since 2010. It was revealed to the court that there were breaches by the former managers since there had been no Annual General Meeting (AGM) of the union since 2010.